Greetings to all our friends. 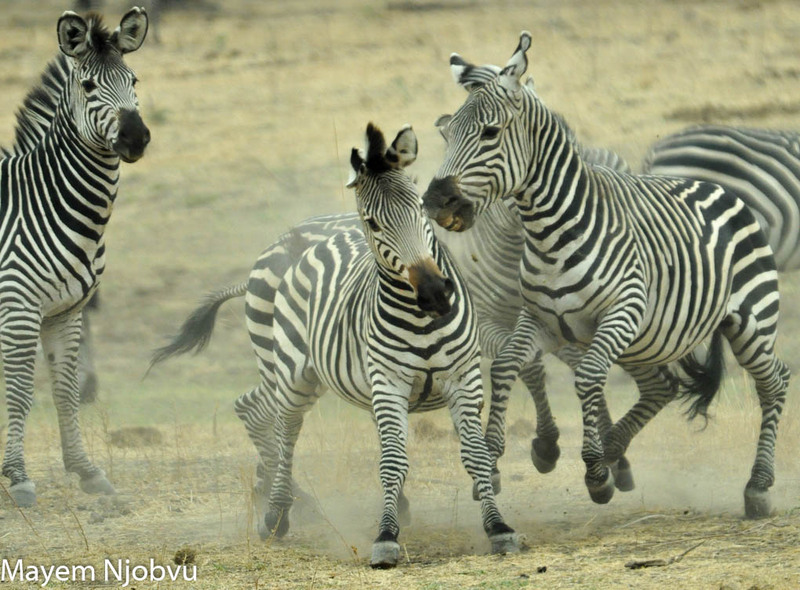 Here’s hoping that you all had a very Merry Christmas surrounded by friends and family, and that you are experiencing a wonderful New Year. The world is currently undergoing an evolution of sorts, with many human conflicts scarring its beautiful features. 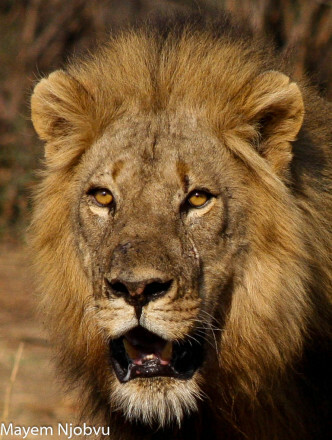 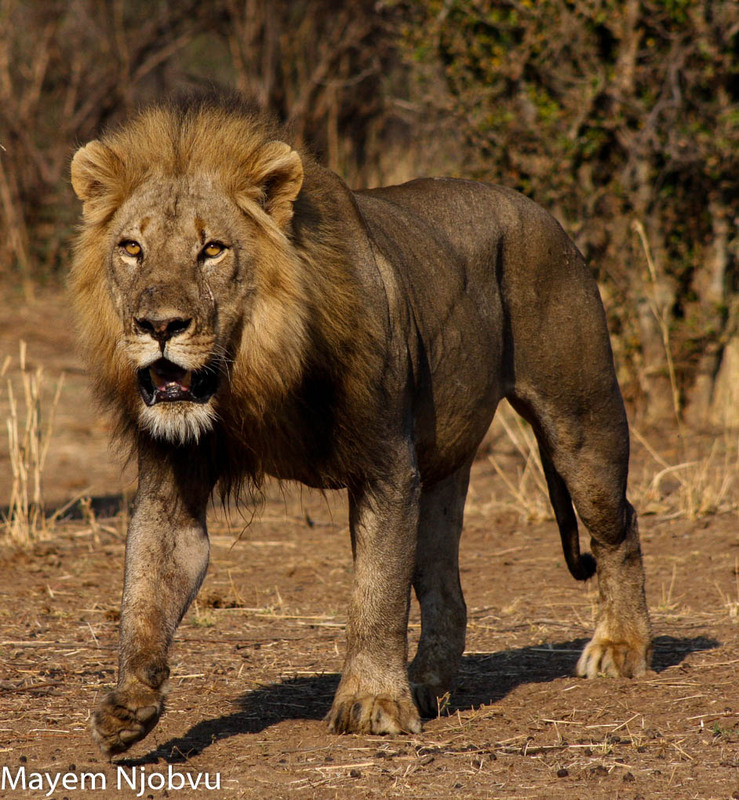 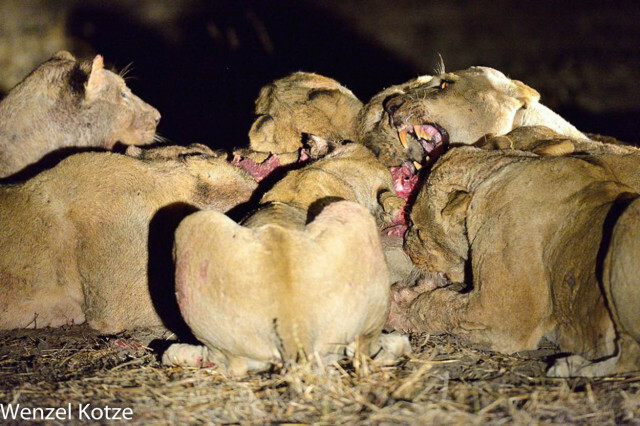 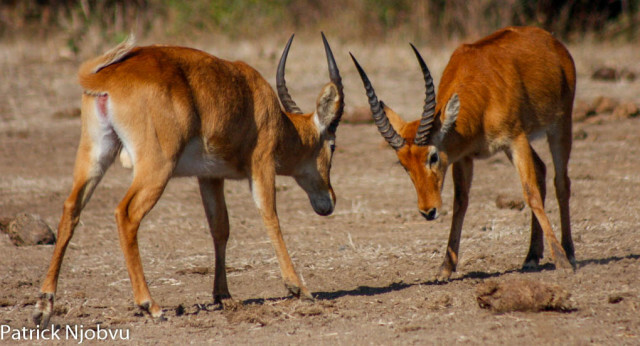 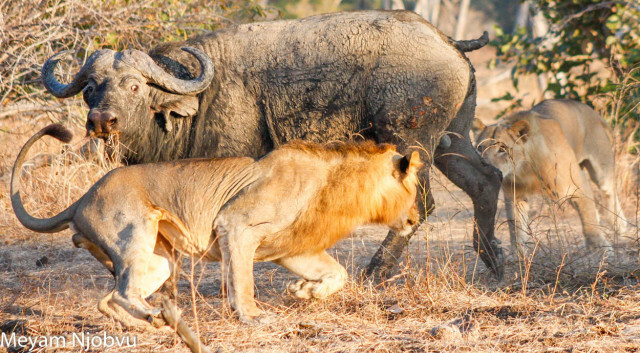 In the South Luangwa National Park, struggles for survival often entail tooth and nail fights that usually end in victory for one, but wounds to both. 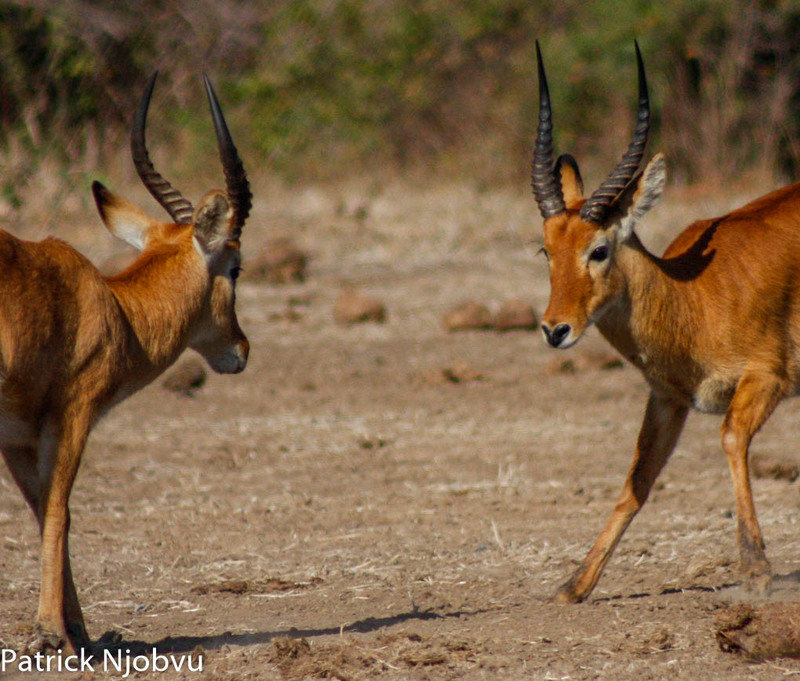 Being in the heart of this park at Kaingo Camp and Mwamba Bushcamp, we are blessed to be able to view these exchanges on a daily basis, as they happen. 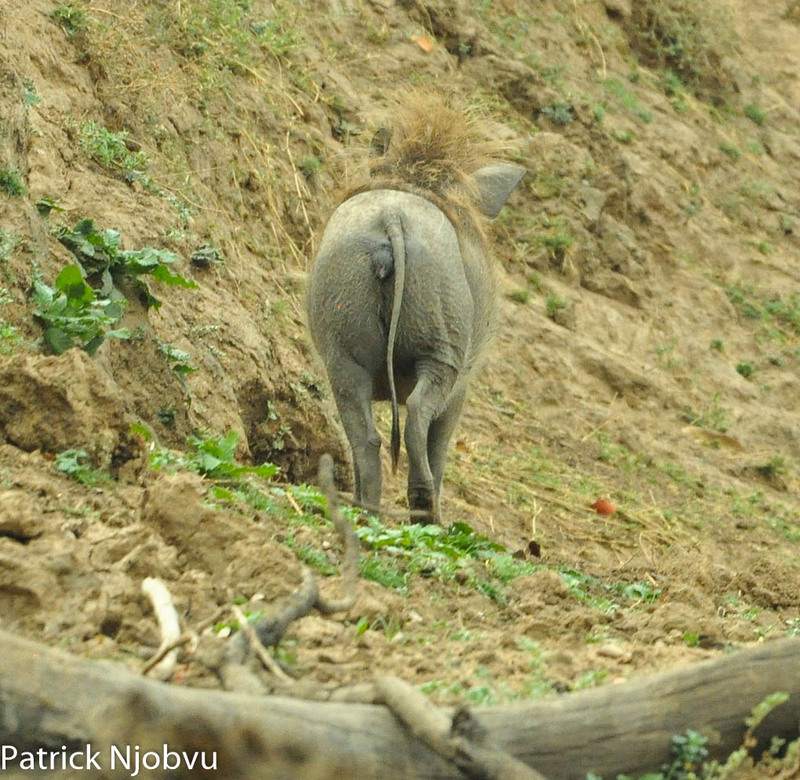 We see many such struggles in our natural surroundings, as evidenced in this non-physical struggle between territorial males Tangua and Nyuma, for a female’s attentions: Tangua heard a female’s low-voiced call and reacted immediately, following it up in the hope of securing breeding rights. 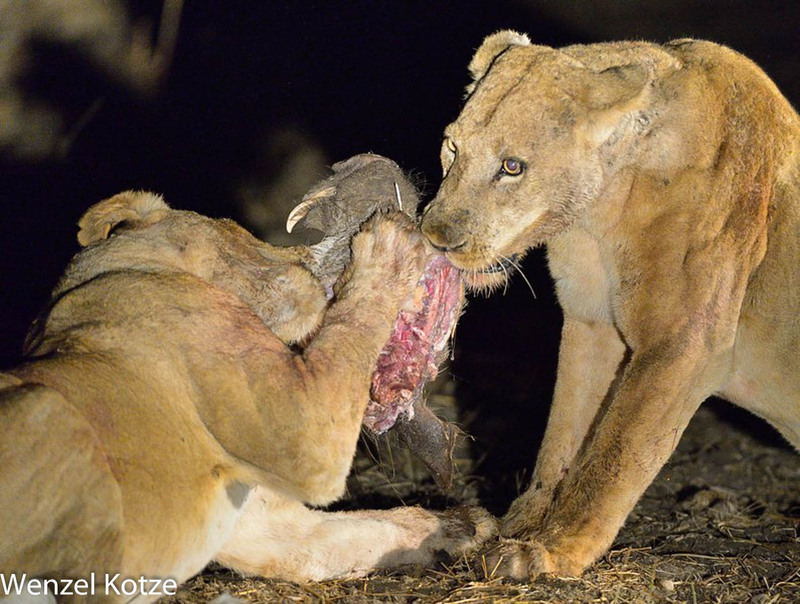 The female watched anxiously as her `knight’ charged closer. 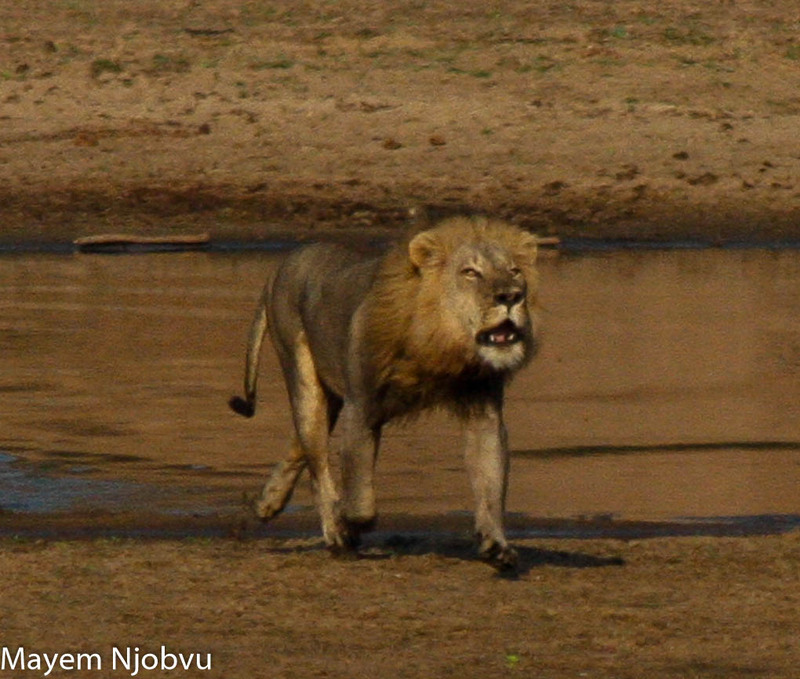 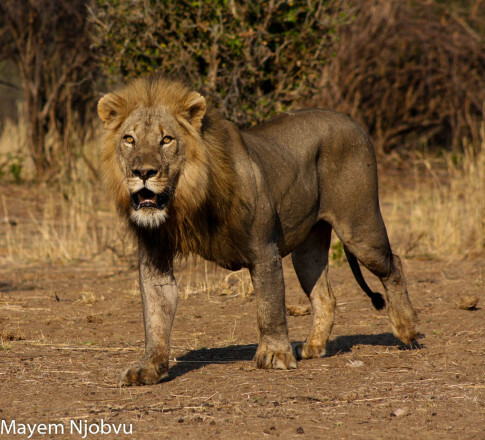 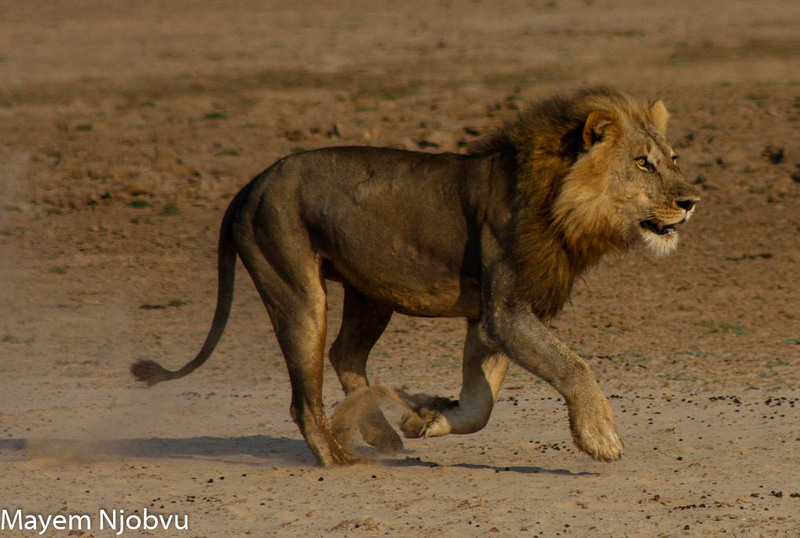 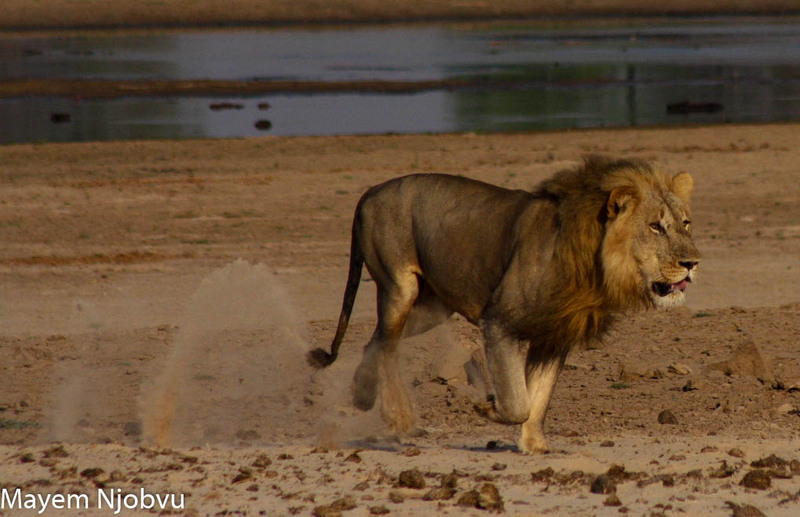 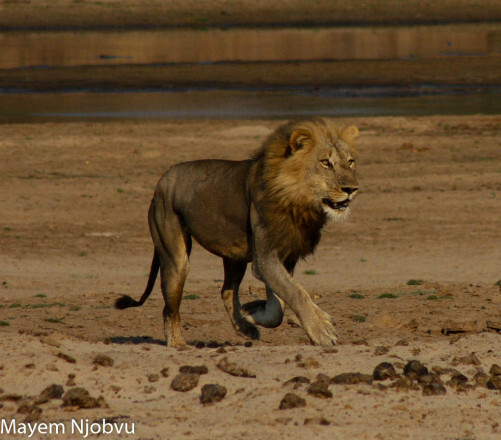 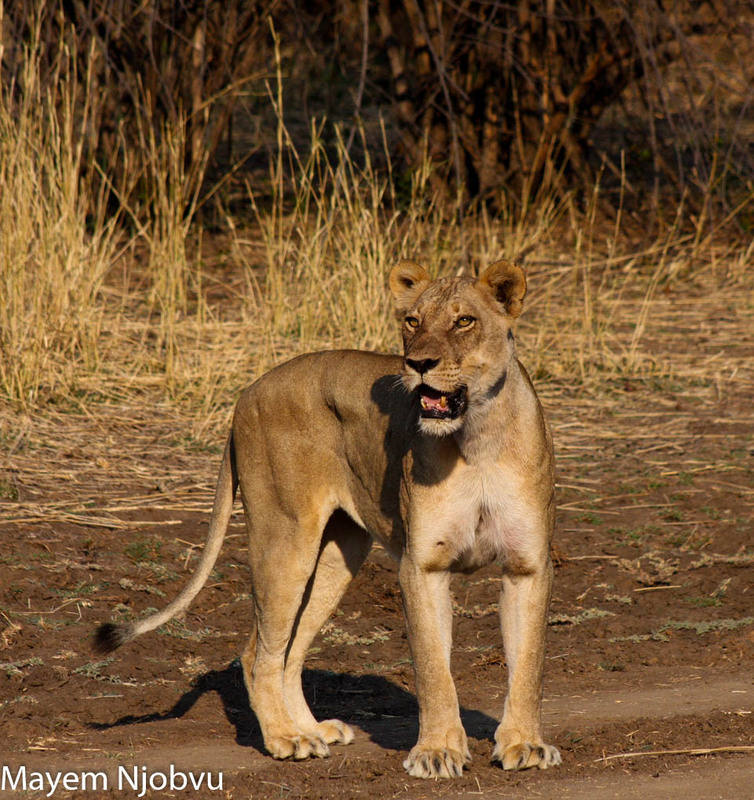 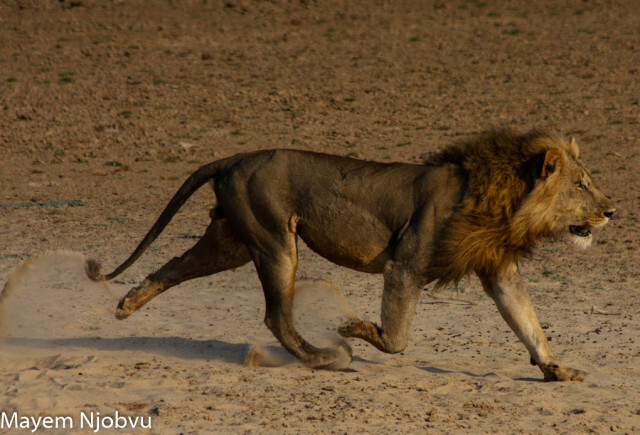 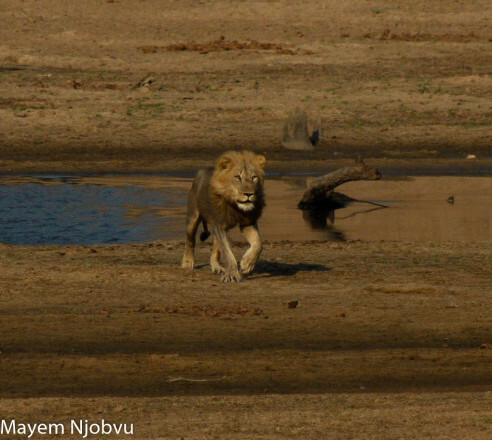 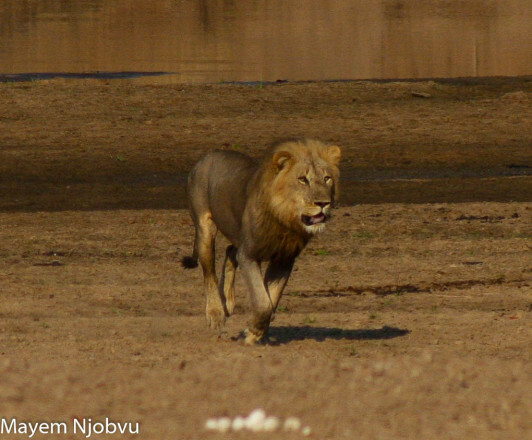 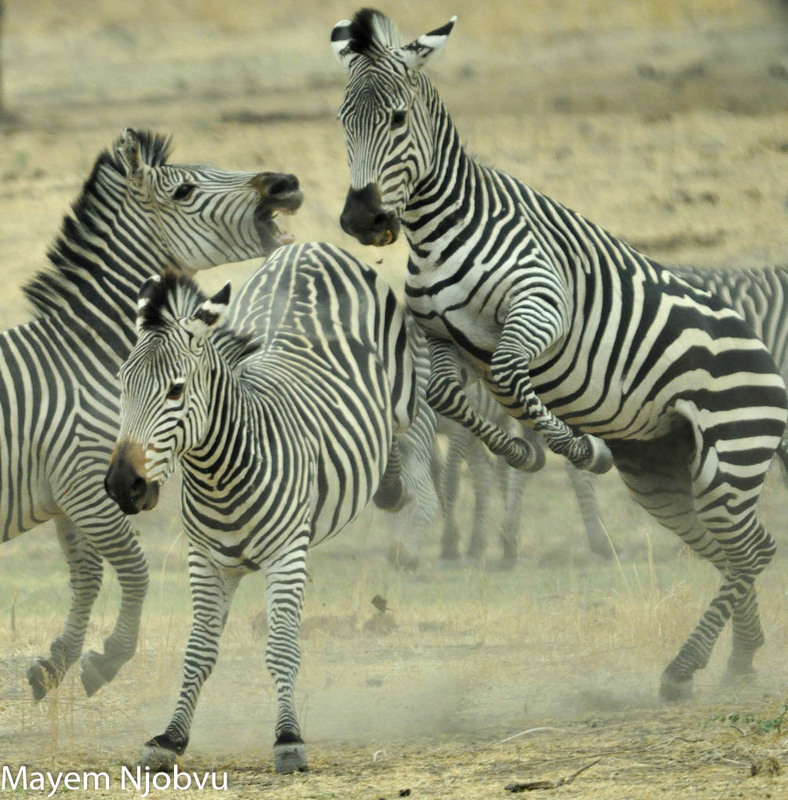 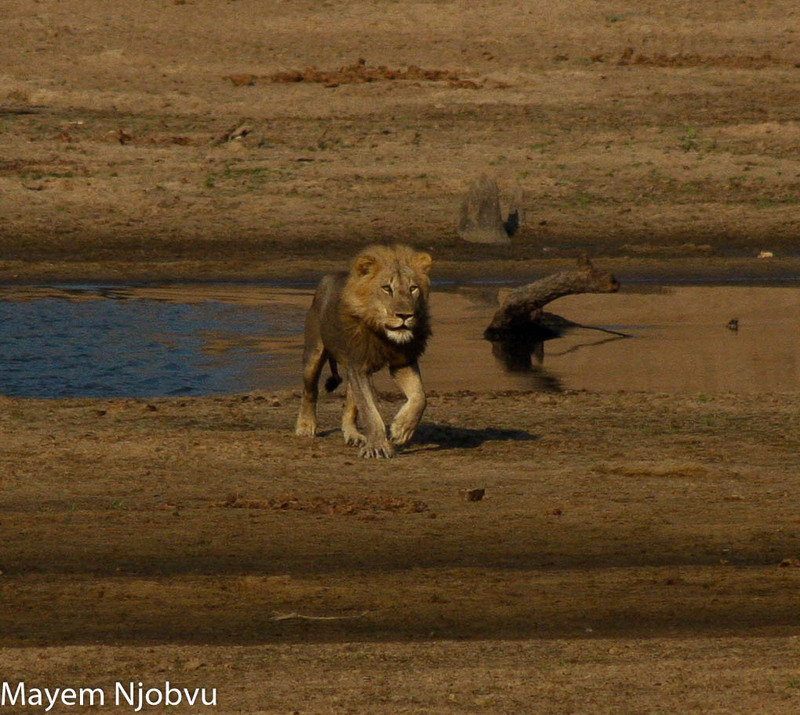 Nyuma realised that his brother had reacted first and came at a run, calling as he raced to catch up. 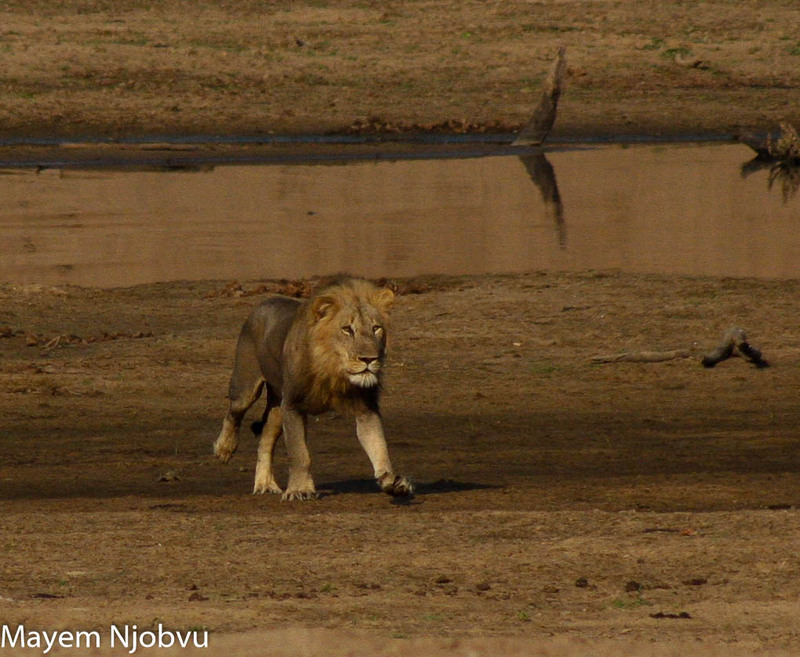 and the conflict was averted by sheer force of presence. 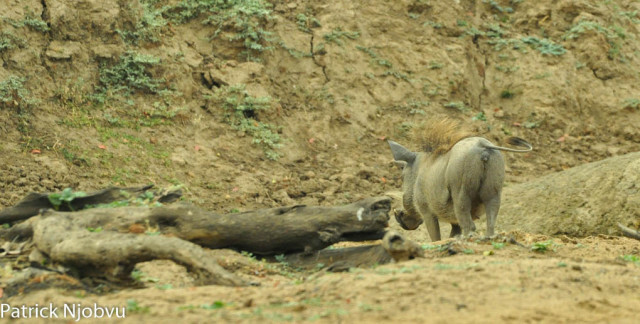 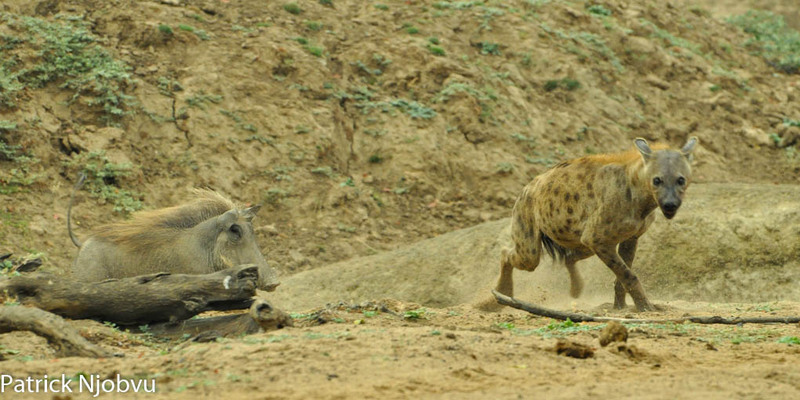 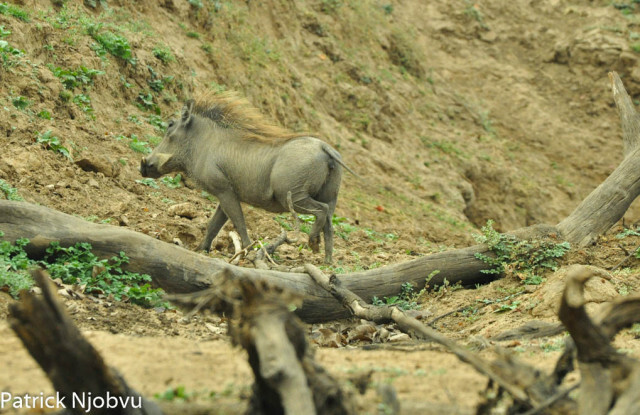 Sensing that the hyaenas will not happily share the shade and wet sand around a drying pool, the warthog changes tack and tackles the problem from another side. He mulls over his next move . . .
. . . and then charges scattering them among the sand dunes. 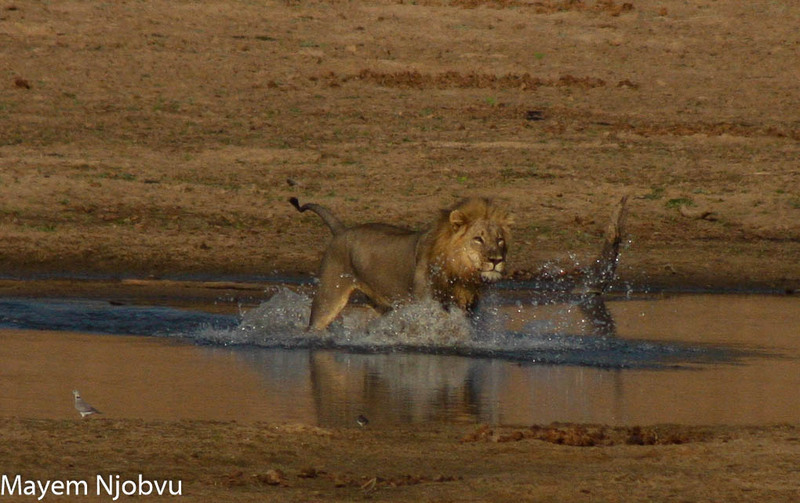 Conflict over, he saunters to the pool with a satisfied swish of his tail. 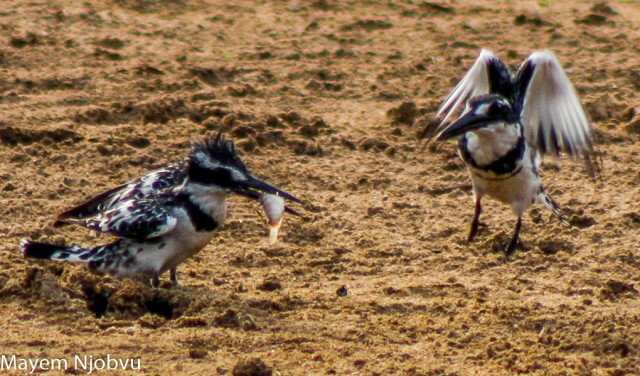 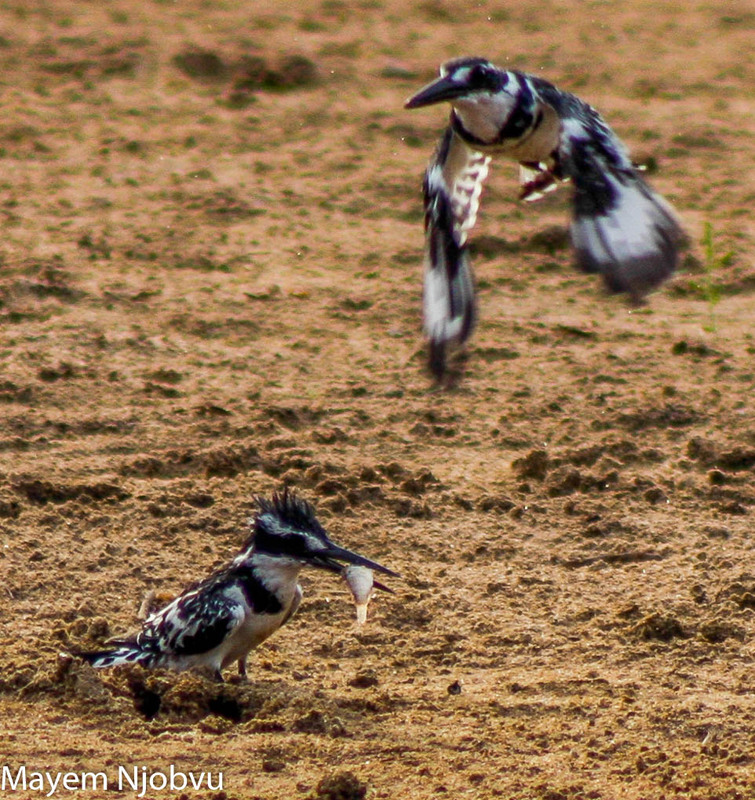 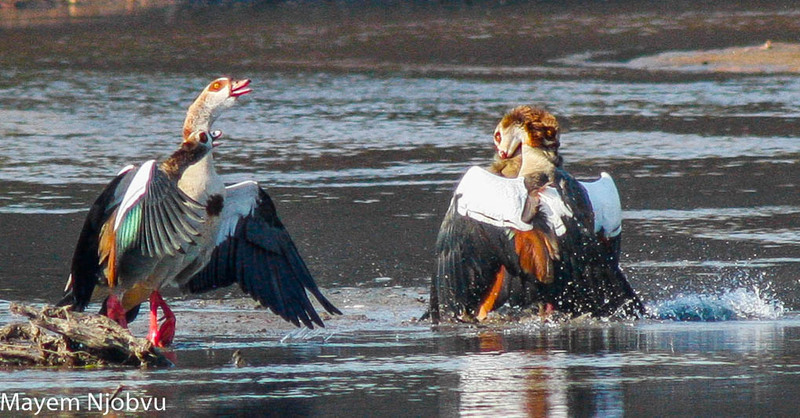 Many species of birds are fiercely territorial, if only seasonally so and even against their own offspring. 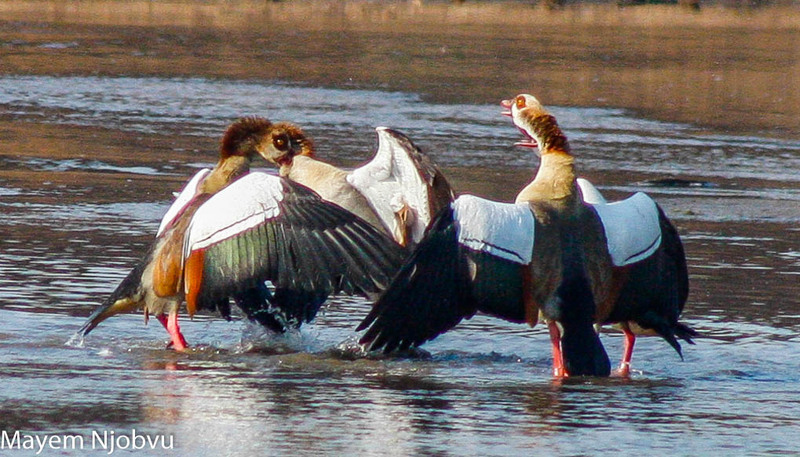 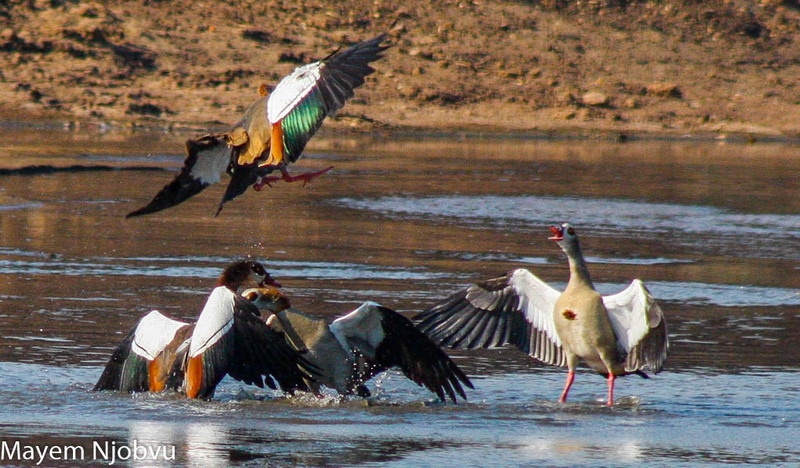 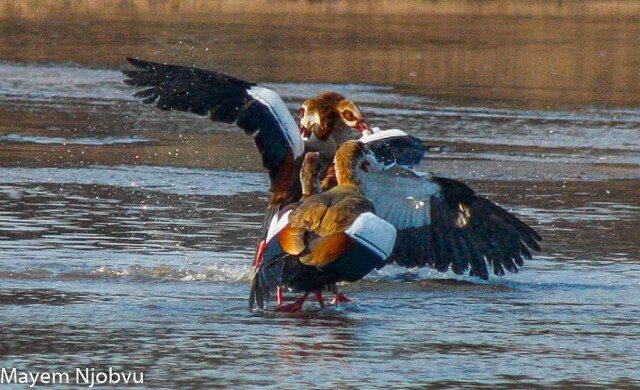 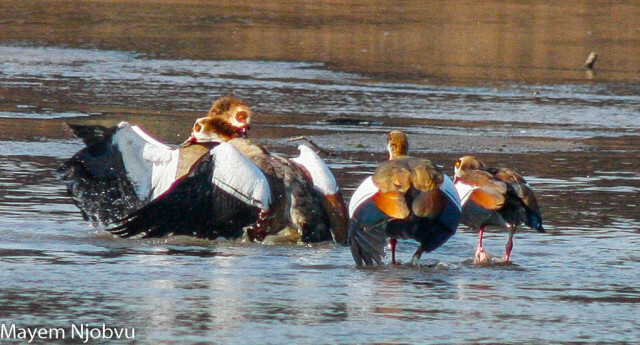 A territorial pair of Egyptian geese set upon an interloper, as the set-upon goose’s mate comes in to help. 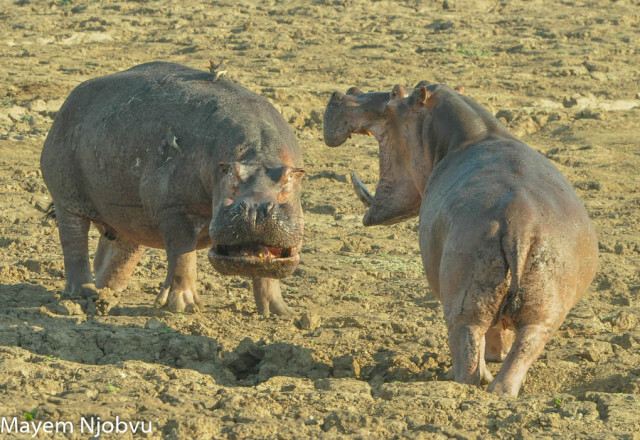 Two battles now ensue, with one consisting of real aggression and the other reduced to a shouting match. 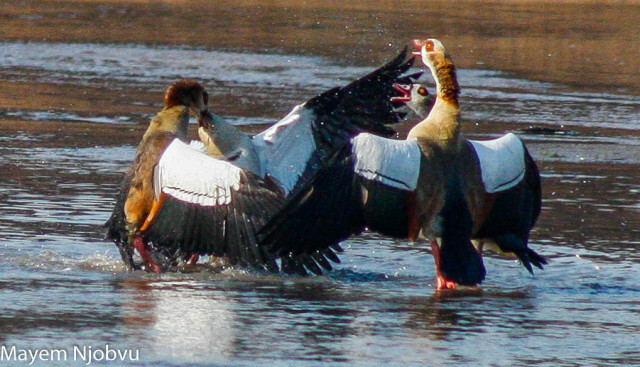 Geese bite onto their opponents and hold them in powerful grip while beating at each other with stiffened wings. 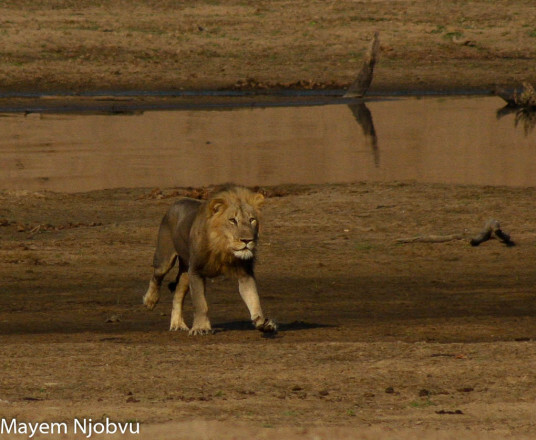 The fighting intensifies until one overpowers the other and drives it away, vanquished for the day. 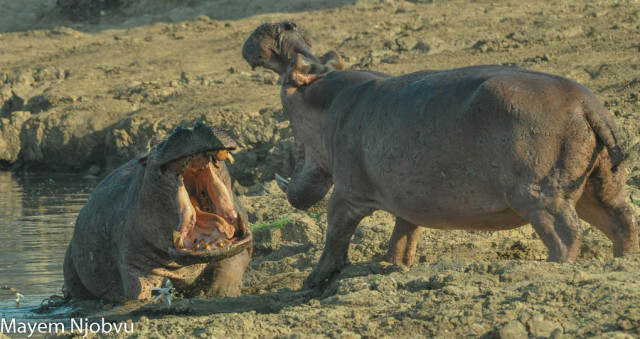 with the have not in many cases, failing to profit from the confrontation. 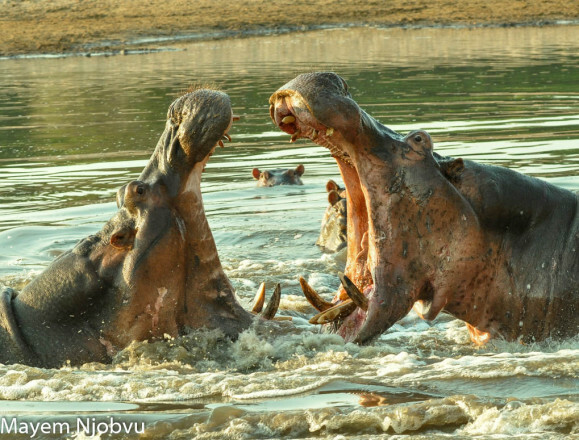 And fights between bull hippos over space or breeding rights are legendary in their ferocity. 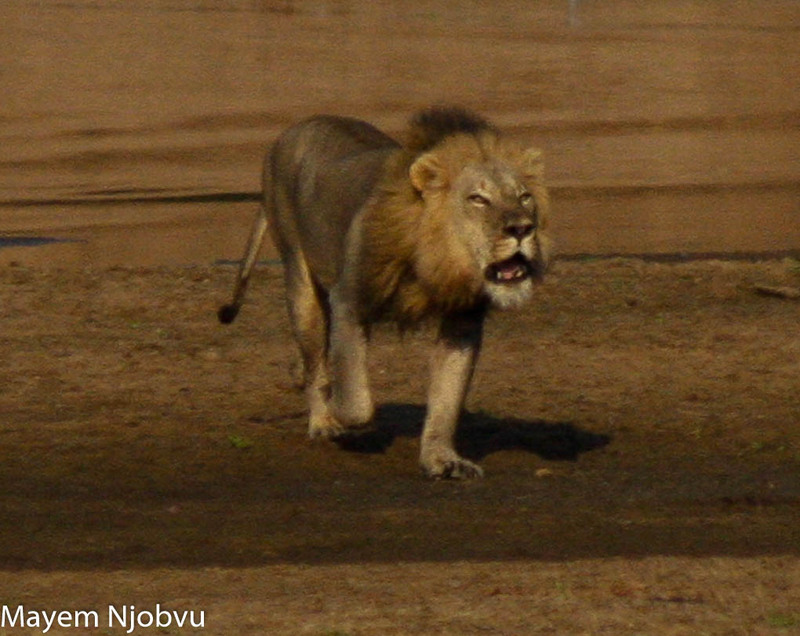 before getting down to the serious business of pushing and shoving and slashing. 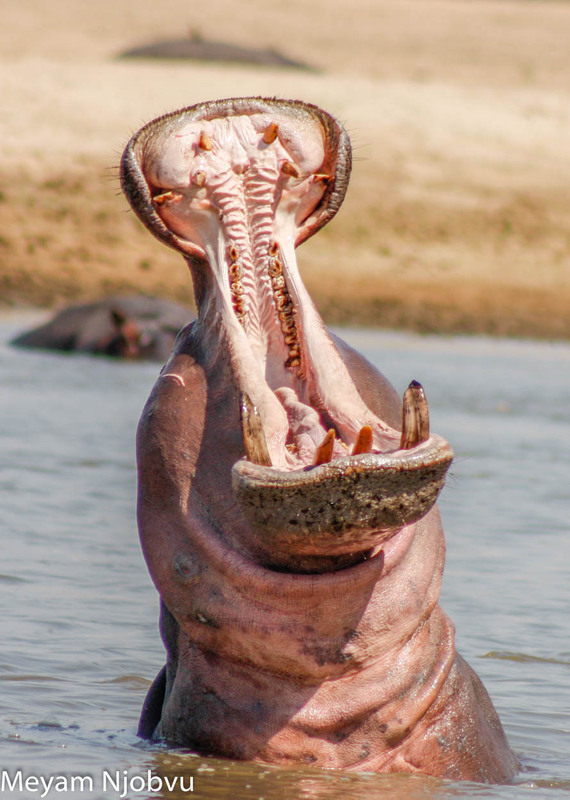 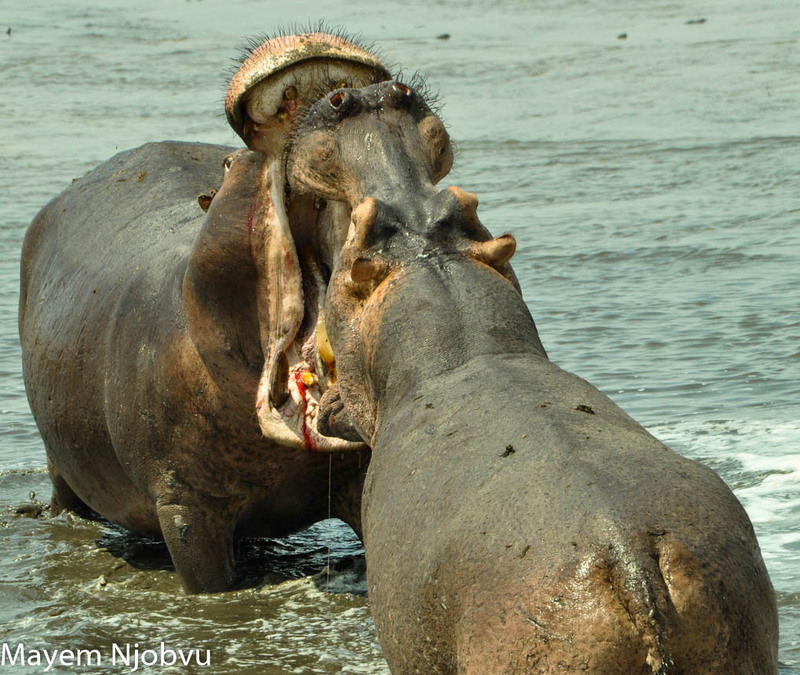 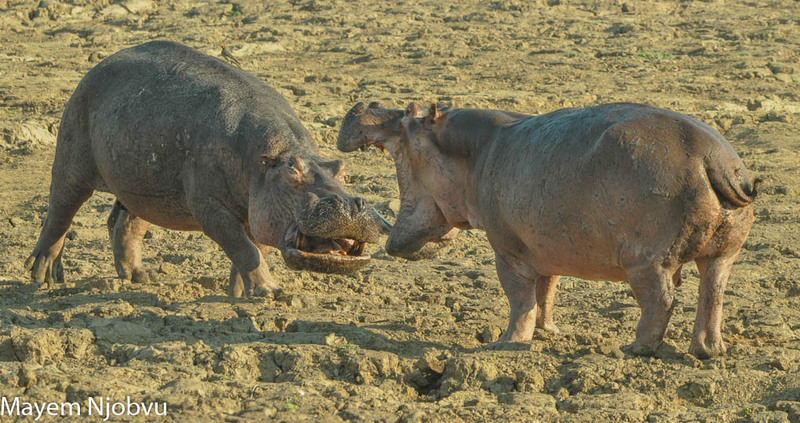 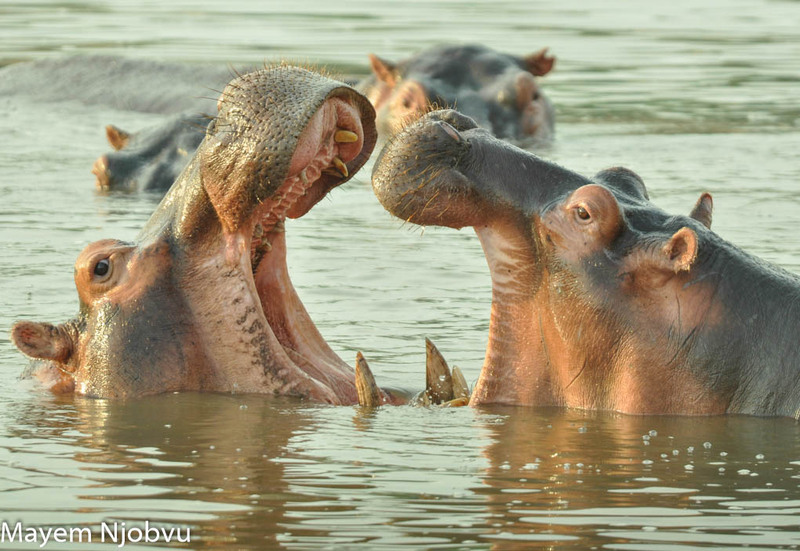 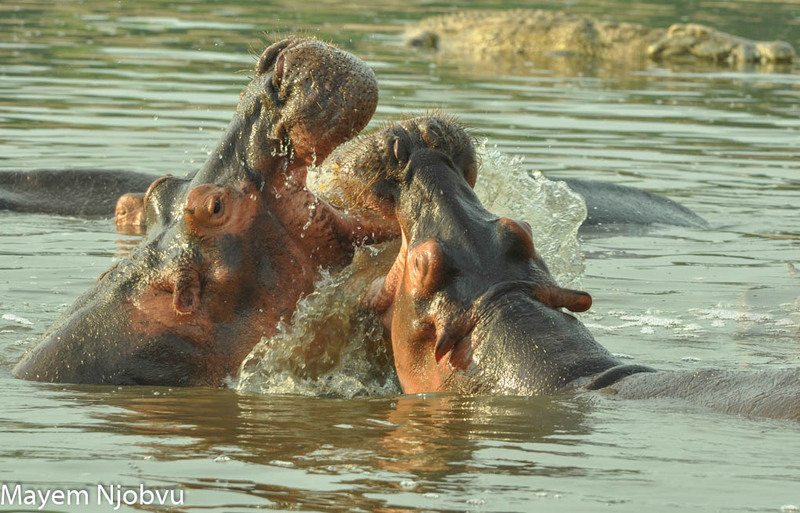 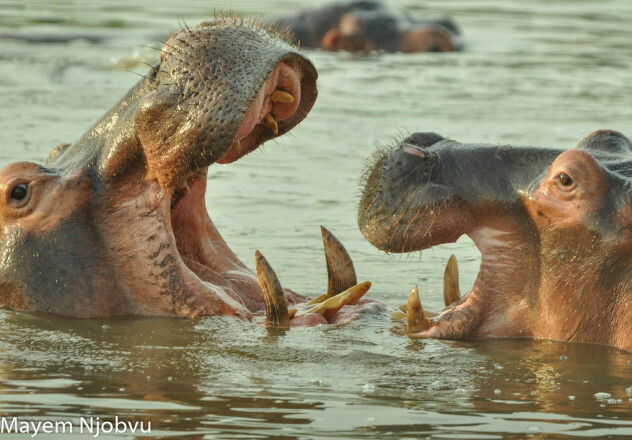 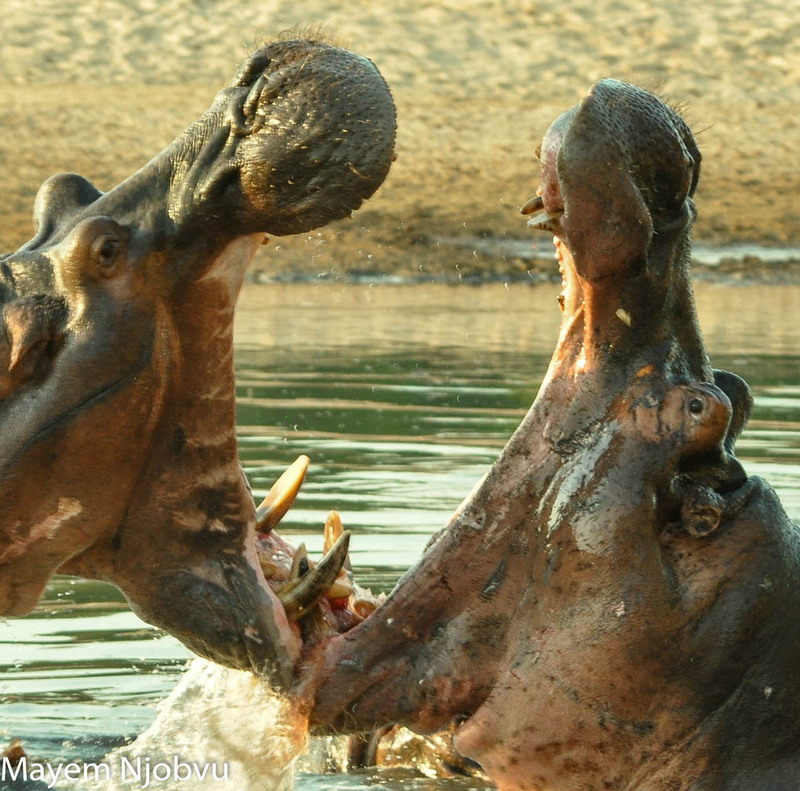 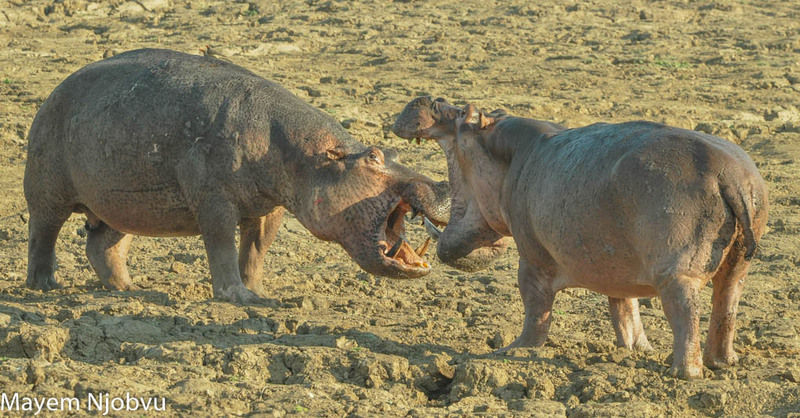 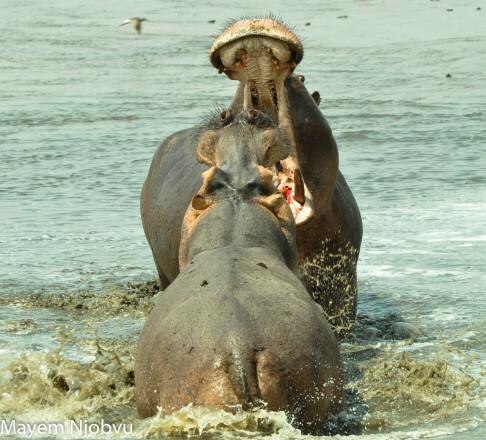 Many serious fights between hippos result in serious injury to both and in some cases to the death of one or both. 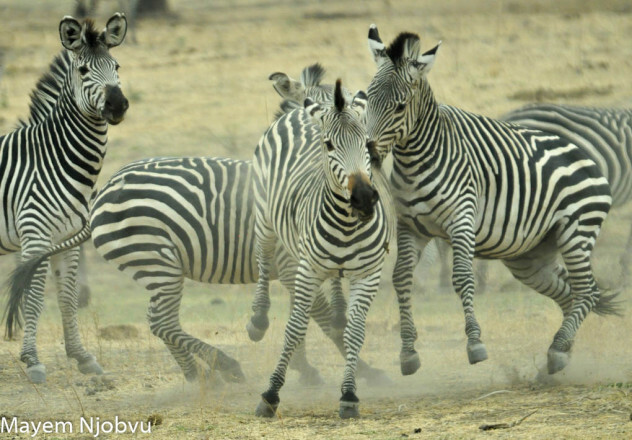 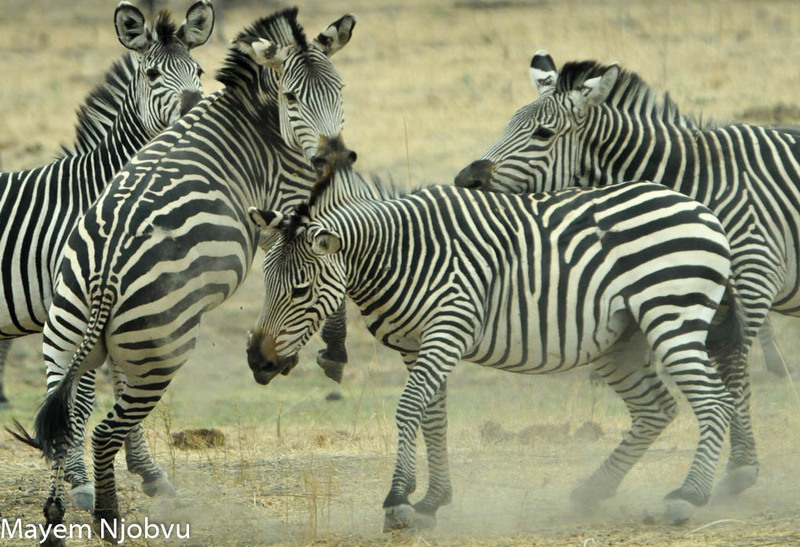 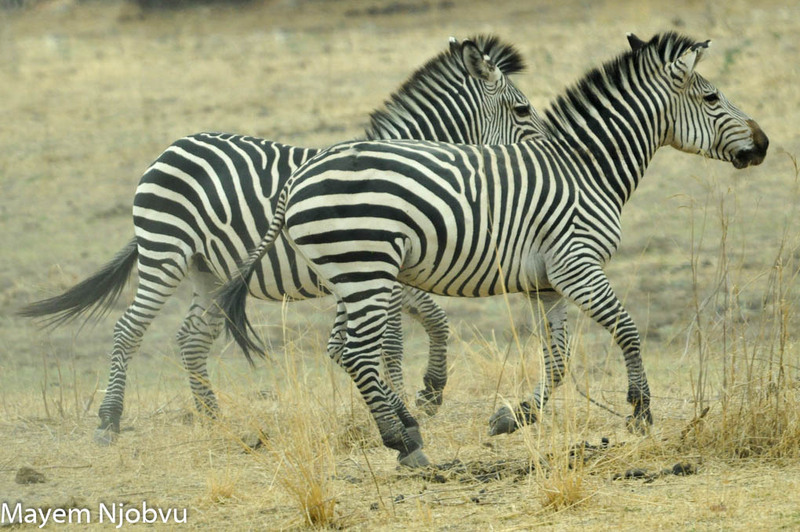 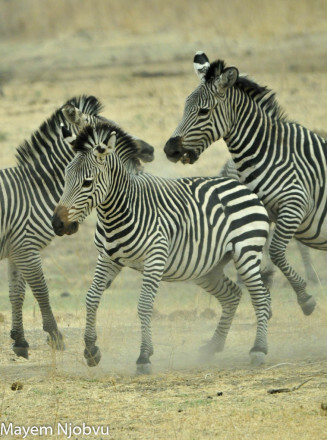 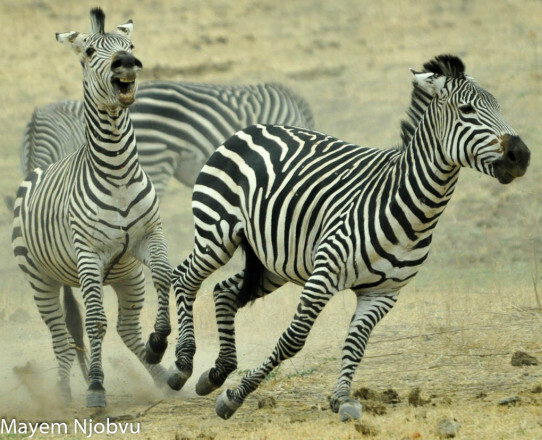 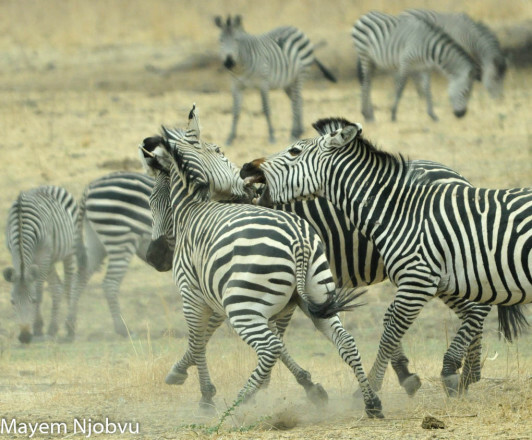 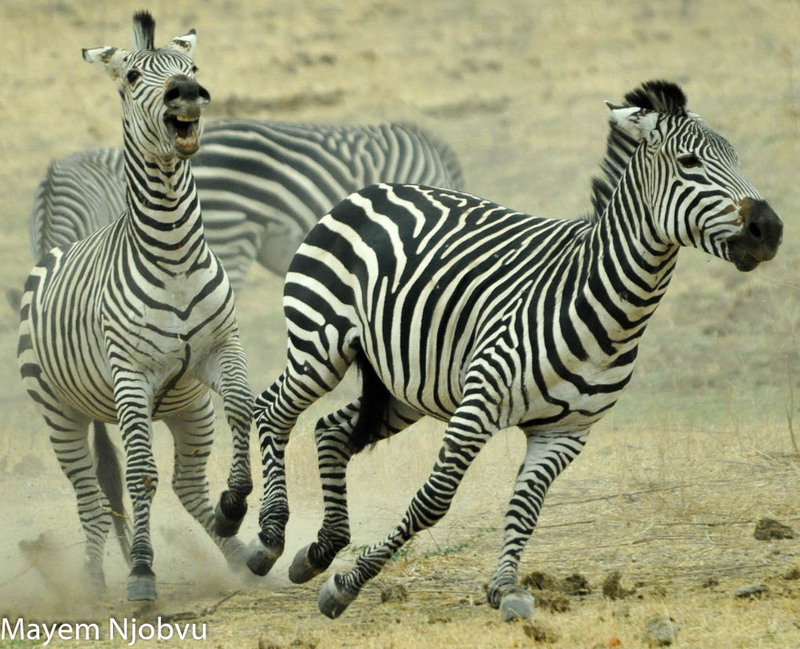 In order to establish a harem of his own, a young male zebra will have to `steal’ the daughters of another, older, established stallion. In many cases the action is staged for the benefit of the mares, with no real damage done. 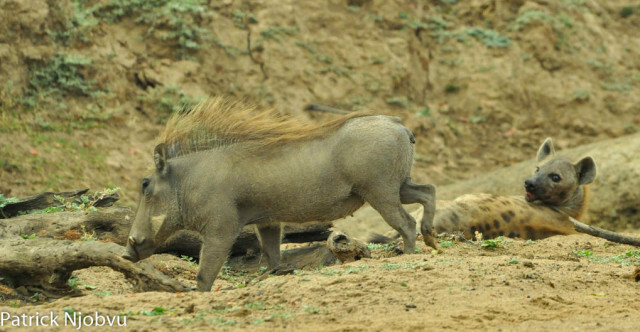 Conflict over, the young stallion lopes away with his prize and life starts again. or a good, hard stare is worth a thousand battles. 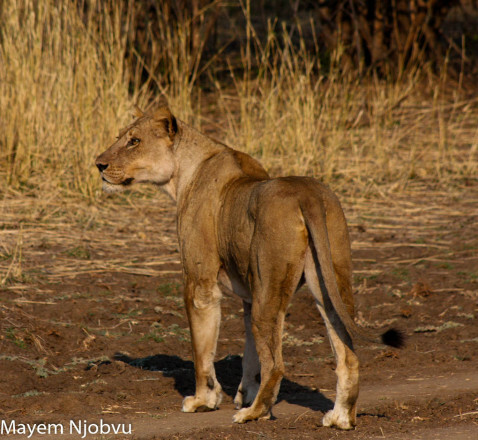 Hopefully the year ahead will bring more of you back, to the `peace and quiet’ of nature at its best in the South Luangwa National Park, where you can enjoy it to its fullest in the company of Shenton Safaris. 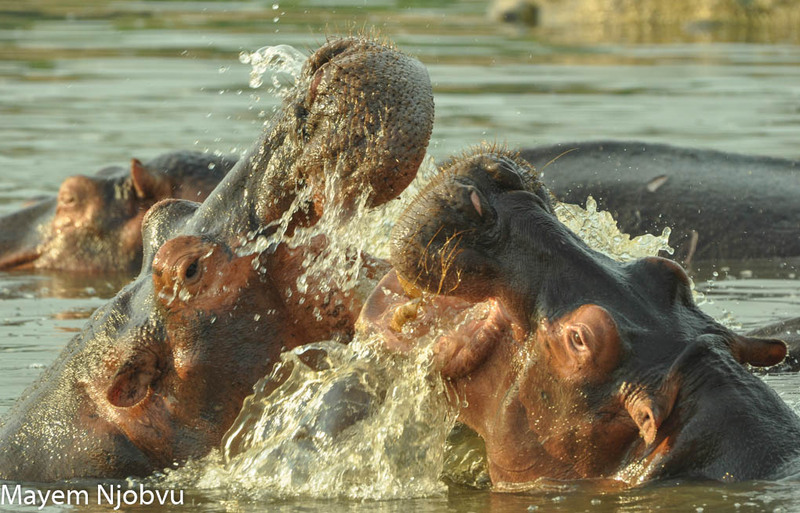 Once again we wish you a happy, healthy and prosperous New Year. 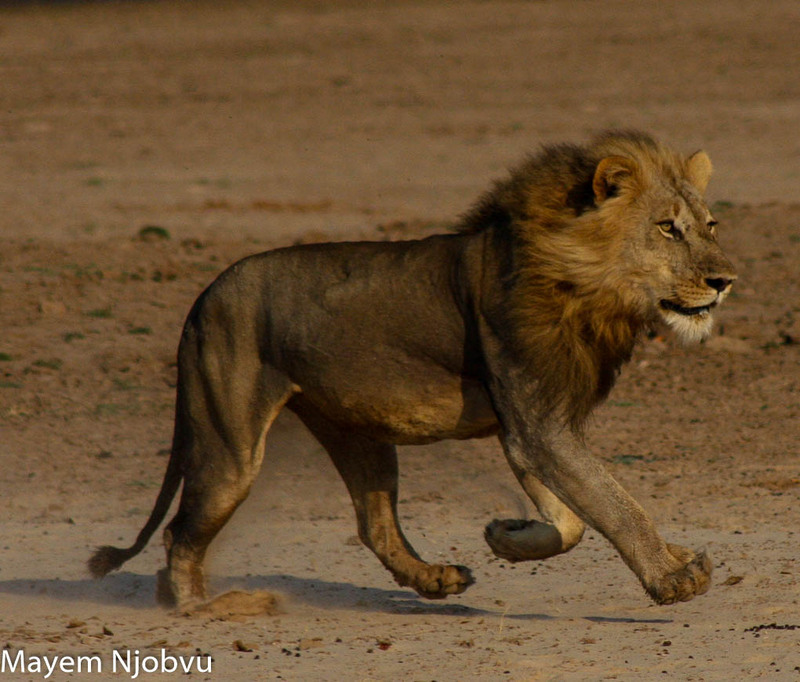 From all of us at Shenton Safaris, all the very best until next month.